Nobel laureate Dr. John F. Nash outlined economic game theory and his pioneering role in its development last night. Edmond was a pioneer in the study of particulate matter and trace elements in the oceans. Boyle said that Edmond started his career researching the role of carbon dioxide in the ocean. Edmond also studied the chemical cycles of other elements and compounds in the ocean. Nobel laureate Charles H. Townes gave a lecture last night discussing the research that proved the existence of a black hole at the center of the Milky Way galaxy. Sam Jahanmir ’01 hadn’t traveled much before last summer. The Wellesley College community welcomed back two illustrious alumnae last Friday as the school celebrated the 125th anniversary of its founding. The Undergraduate Association Council elected Victoria K. Anderson ’02 as its speaker for the upcoming academic year. 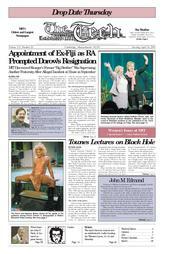 Do you feel like you are treated any differently as a woman at MIT? Reporters: Gretchen Aleks, Melissa S. Cain, Nancy L. Keuss, Eun J. Lee, Shankar Mukherji, Matthew Palmer, Joel Rosenberg, Jordan Rubin, A.S. Wang, Jennifer Young; Columnist: Christen M. Gray; Editor: Mike Hall; Associate Editor: Jyoti Tibrewala; Copy Editors: Jennifer Krishnan, Dana Levine, Eric J. Plosky, Naveen Sunkavally; Layout: Joel Corbo, Ryan Ochylski; Photography: Pedro L. Arrechea, Roshan Baliga, Erika L. Brown, Sephir Hamilton, Aaron D. Mihalik.